Hobie Forums • View topic - Why is my Hobie 14's serial number crossed out? Post subject: Why is my Hobie 14's serial number crossed out? I'm trying to find out why my pre-1973 Hobie 14 has its serial number crossed out--or so it appears. I was hoping someone would be able to tell me something about the numbers in the pictures. The four numbers have "strike" marks through them that look like the number 1 and you can see those in the picture. Why is it like that? There are the first four numbers which are 4271 and then a little bit over are three numbers which look like 112. All the numbers have the number 1 struck through them at various angles (some more than one time) EXCEPT the last number which is 2. The numbers are on the outboard side of the forward pylon coming out of the port hull. On the outboard side of the starboard pylon it only has the set of three numbers 112 (second picture). They look the same pretty much. Each 1 is struck through with an angled 1. There are no numbers on the transoms. 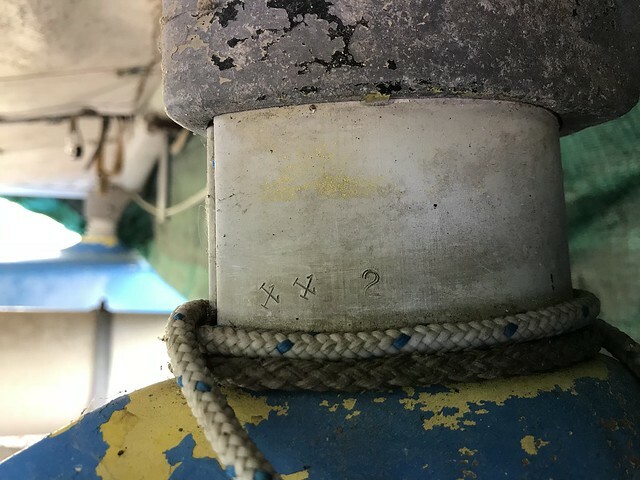 I'm assuming it is probably a 1971 or 1972 since MBounds said (in a reply on another thread) the serial numbers for the Hobie 14 went up to mid-5000s before they changed the format of the serial numbers and moved them to the transom. I just don't know why the numbers are crossed out! Anyone have any ideas? Thanks so much! 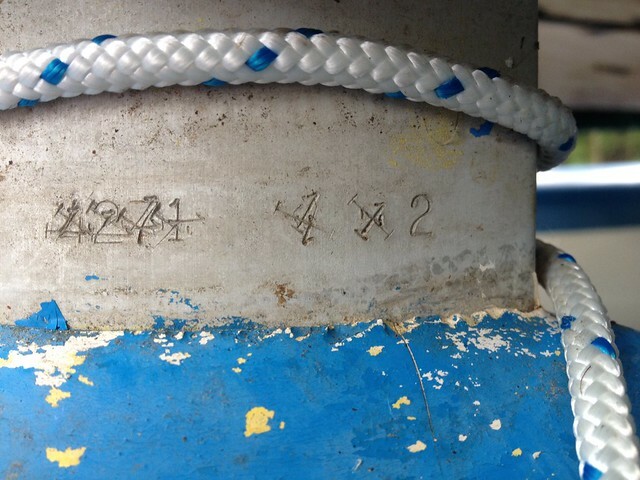 Post subject: Re: Why is my Hobie 14's serial number crossed out? Very odd one. Even my best historian was baffled. Maybe hulls were used as replacements on another boat. Seems the one was 4271 originally. Thanks for trying Matt! I appreciate you responding! I’m just not going to worry about it anymore! I’m going to finish repairing her and go sail!! I’ve fixed the soft spots thanks to all the great advice I’ve gotten on this forum and now they are in great shape! The drilling and injection of epoxy method wasn’t that bad after I just got going on it. Now I’m sanding and prepping the surface for gel coat. I got a new trampoline for her so she will be as good as new soon!! Can’t wait to hit the water! !